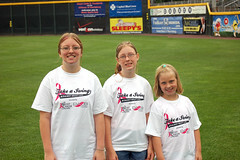 Posted By PA Breast Cancer Coalition on July 30th, 2011 at 11:04 am | 129 comments. 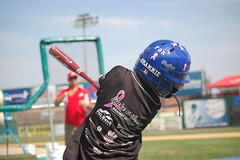 The 4th Annual Take A Swing Against Breast Cancer home run derby is coming to a quick close. Where did July go?! 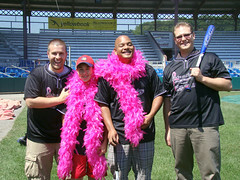 The PBCC crew was excited for the derby to be at the Altoona Curve. And the day did not disappoint! Check out our high scores and the home runs that just kept on coming! We handed out quite a few pink and white home run baseballs at Blair County Ballpark. We love seeing home runs, so we certainly enjoyed the day! Congratulations to all of the batters! Special thank you to the Altoona Curve, the staff, interns, field crew, and everyone who made the Home Run Derby a great day at Blair County Ballpark! WJAC, WTAJ and the Altoona Mirror all stopped by to check out the event. Thank you for helping to raise awareness in the Altoona area! 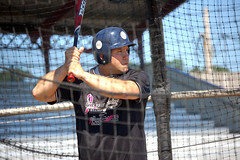 Check out some of the great photos from the 10th stop of the 2011 Home Run Derby! 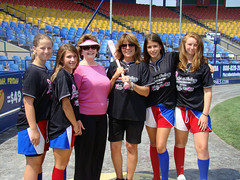 Posted By PA Breast Cancer Coalition on July 29th, 2011 at 9:38 am | 124 comments. On Tuesday, July 26th, the Home Run Derby made a stop at the Historic Bowman Field. The Williamsport Crosscutters welcomed the home derby batters and volunteers as we head into the home stretch for 2011. Our only Home Run Hitter in Williamsport was Josh Kendrik from the PA State Police. He hit two out of the park!Special thanks to Rep. Garth Everett, Mike Mussina, and all of our batters who swung for the fences. Thanks to everyone who came out and supported the derby. We raised over $9,500 through the efforts in Williamsport! Check out the photos from our day at the ballpark. Posted By PA Breast Cancer Coalition on July 28th, 2011 at 1:57 pm | 35 comments. The record high temperatures didn’t stop 21 teams, 3 single batters and dozens of volunteers from coming out and participating in the Home Run Derby on July 23rd. 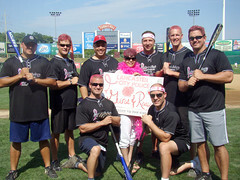 The event at Clipper Magazine Stadium raised an astonishing $11,500 for the PA Breast Cancer Coalition! None of this would have been possible without these teams and home run hitters! The Lancaster Sunday News hung out for the day and grabbed some shots of Andrew Hackart and the Guns of Roses. Check out the story online. It was great to see fans cheering on the batters and volunteers working together in the outfield. The teams put up some high scores and it was a close battle all the way to the end! Rep. Eugene DePasquale’s Team 1 ultimately scored the 4 hot pink bats, but everyone is a winner for coming out and supporting the fight against breast cancer! Take a look at the photos from our day in Lancaster! Posted By PA Breast Cancer Coalition on July 26th, 2011 at 8:20 am | 110 comments. The Heatwave: Summer 2011 continued on Friday, July 22nd at Sovereign Bank Stadium in York. The sun and heat didn’t keep the batters from striving for the outfield wall. If you’ve ever been to Sovereign Bank Stadium, you’re familiar with their Arch Nemisis in left field. Some of the home run hitters knocked it over the 37.7 foot wall! Check out the team scores and home run hitters! Special thanks to FOX43 for their participation and covering the derby! Our volunteers stuck with the day through the hottest point and chugged the water! Thanks to everyone who made the event on Friday possible! Be sure to check out the photos from our day. Posted By PA Breast Cancer Coalition on July 20th, 2011 at 12:56 pm | 123 comments. It was Tuesday, July 19th. The setting was the newly-redesigned FirstEnergy Stadium, home of the Reading Phillies. The temperature was approaching triple digits. And the humidity was out in force. These, however, were the perfect conditions for our teams to step up to the plate and show their support. Check out how the teams fared through the beginning of Heatwave: Summer 2011. Friends, family members and colleagues were out in force to show their support for the batters. Thanks to those who came out, including the volunteers! Everyone made the day a success. Special thanks to WFMZ for stopping by to cover our day at the ballpark. 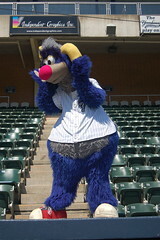 Check out some of the great photos from our muggy day at the Reading Phillies. Posted By PA Breast Cancer Coalition on July 20th, 2011 at 12:28 pm | 122 comments. Did you know that PNC Field, home of the Scranton/Wilkes-Barre Yankees, is actually located in Moosic, PA? 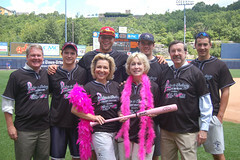 The Triple-A Affiliate of the New York Yankees hosted the Take A Swing Against Breast Cancer home run derby on Friday, July 15th. The park rolled out the red carpet for our batters and volunteers as we collected a few home runs in NEPA. The home runs may have come from a handful of teams, but they all add up! Another huge thanks to the volunteers who were in the outfield shagging those baseballs! We would not be able to hold the home run derby without you. WBRE and WNEP were able to stop by PNC Field to highlight the day. Thanks for helping to raise awareness in the NEPA region. There are some great photos from our day at the ballpark. Take a look below! Swing For Support Raises $3,200! Posted By PA Breast Cancer Coalition on July 20th, 2011 at 10:34 am | 106 comments. Blue Ridge Country Club and Executive Woman’s Gold Associate hosted a successful golf event, organized by Glenda Dechowitz, on Tuesday, June 28 raising $3,200 for the PA Breast Cancer Coalition! Swing for Support took place at the Blue Ridge Country Club where golfers of all expertise came out to play 9 holes of golf followed by a dinner and prizes. All of the funds raised by the event were donated directly to the PA Breast Cancer Coalition, which means the money remains in PA to help the 103,000 women living with breast cancer in the state. Thank you to everyone who participated and raised not only funds, but awareness, for the PA Breast Cancer Coalition! Posted By PA Breast Cancer Coalition on July 18th, 2011 at 12:14 pm | 102 comments. 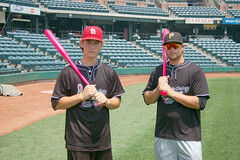 Wednesday, July 13th marked a special occasion for the Take a Swing Against Breast Cancer home run derby fundraiser: our largest location ever! We had 26 teams, 2 single batters, more volunteers than we can count and raised over $11,000! Take a look at our high scores and team photos from the big day! A HUGE thanks goes out to the Harrisburg Senators and their awesome staff! Without them, we would not have been able to hold a spectacular event! Special thanks to all of the media outlets that stopped by: ABC27, WGAL 8, FOX43 and Blue Ridge 13! Thanks to all who came out and supported our largest event to date! Take a look at all of the photos from our busy day at Metro Bank Park!